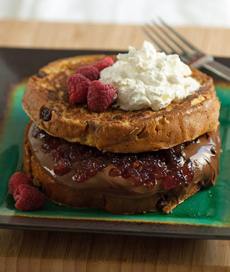 Nutella, jam and panettone French toast. Photo courtesy Bauli. Panettone (pah-neh-TOE-nay) began in medieval Italy as a Christmas bread; but today, the fluffy yellow yeast bread variously filled with raisins, other dried fruit and orange peel, is available year-round. There’s also a version with chocolate bits—an ingredient not available until the latter half of the 19th century. 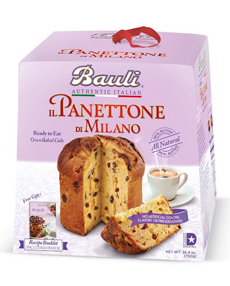 Bauli, whose panettone are imported into the U.S., creates year-round recipes Raspberry Jam & Hazelnut Spread Stuffed Panettone French Toast. We have more panettone recipes, too: Panettone Bread Puddin, Panettone Classic French Toast and a Panettone Nutella Sandwich. Think of this as the most indulgent peanut butter and jelly sandwich you’ve ever had—except that it’s chocolate hazelnut spread instead of peanut spread. You can make it for breakfast, but also eat it for dessert. Panettone is a medieval Italian Christmas yeast bread, filled with candied fruits and raisins. The Milanese specialty, is tall, dome-shaped and airy, in contrast to the other famous Christmas bread, panforte, which is is short and dense (although there is a less common, flat version of panettone). Panettone: It’s not just for the holidays! Photo courtesy Bauli. The dough is cured for several days (like sourdough), giving the cake its distinctive fluffiness. Raisins, candied orange peel, citron and lemon zest, are added dry; some modern versions add chocolate (which was not available when the recipe originated); others are plain. The classic Panettone accompaniment is a sweet hot beverage or a sweet wine such as spumante or moscato; but any dessert wine will do. Some Italians add a side of crema di mascarpone, a cream made from mascarpone cheese, eggs, and amaretto (or you can substitute zabaglione). SEE THE DIFFERENT TYPES OF BREAD IN OUR BREAD GLOSSARY.